The funeral for former president George Herbert Walker Bush took place on Wednesday, December 5, 2018 at the National Cathedral (Episcopalian) in Washington, DC. I’m not featuring too much on this, because a) most people have seen the funeral coverage in the media and b) Bush I was the only American over 60 who said he could not remember where he was when John F Kennedy was assassinated. I certainly remember where I was, and I was only a small child at the time. That piece of Bush history came to light only a few years ago, thanks to the online world. Others might have already known it through lesser-known political writings. Until that point, I admired Bush I a lot. I was delighted with the ‘Thousand Points of Light’ speech, which Peggy Noonan (Obama supporter, anti-Trumper) wrote. Bush delivered the speech when accepting the Republican nomination for president in 1988. On the whole, I think he did a good job as president and was certainly worlds better than his opponent, Michael Dukakis from Massachusetts, would have been. My two objections to Bush I’s presidency were ‘no new taxes’ which, strangely, ended up as new taxes, thereby enabling Clinton’s victory four years later. The other was the end of the first Gulf War, which seemed a bit incomplete. It was not surprising, therefore, that a second Gulf War ensued. My condolences go to the Bush family, which is large and close-knit. They lost their two most important family members this year. Barbara Bush died in April. I believe that the former president, despite his chronic ailments, died of a broken heart. Before moving on to Bush’s funeral, one must look at John McCain’s service, which was held three months to the day earlier: September 5. Something happened at his funeral that recurred at Bush’s. Now on to the former president’s funeral. President Trump was informed of his death whilst at the G20 in Buenos Aires, on the evening of Friday, November 30. He and Melania issued a joint statement. He also spoke with Bush II and Jeb the following morning. Friends, I have just been contacted by Fox News and informed that due to HW Bush’s funeral, many segments including mine have been cancelled for tonight. I will update you when I know more. Meanwhile, the Bush family assured President Trump that no one speaking at the service would criticise him. They did that because the notional eulogies at McCain’s funeral were a Trump hate-fest. At the funeral service, once again Melania Trump was seated next to Obama, just as she was at Mrs Bush’s funeral. 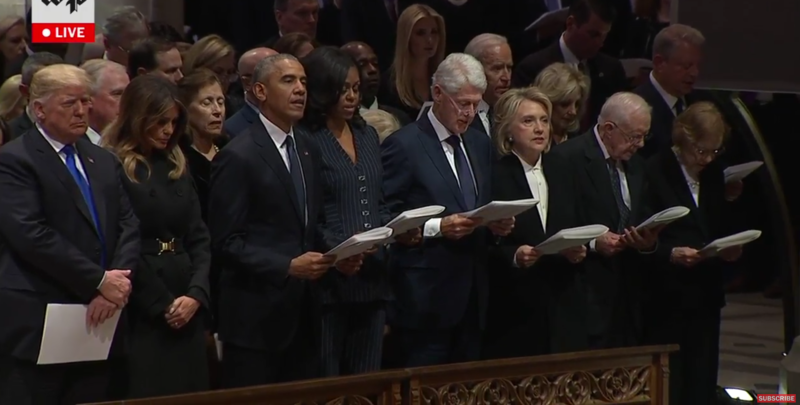 On that subject, a group photo of presidential couples appeared after Mrs Bush’s funeral. Mrs Trump was cropped out in many articles using it. Here is the full photo, with Mrs Trump standing next to Michelle Obama. It looks undignified to me, too, but I know nothing of Washington DC funerals for dignitaries. A few unusual things happened. And, finally, for whatever reason, the Trumps refused to recite the Apostles Creed. That aside, President Trump, in the media’s eyes, could do nothing right. The media are wrong. He shut down Washington DC — and post offices across the nation — on December 5. In closing, may President Bush rest in peace. Many thanks to Martin Geddes for coming out with two very important graphics explaining the Democrats and the media. Note the colour codes. Twitter gives everyone in Big Media a pass. Citizen investigative journalists, not so much. Last week, the tech giant banned feminist Meghan Murphy for questioning the ideology behind the transgender movement. Interesting, especially when the four who were censored are relatively young supporters of President Trump and MAGA. It’s as if Twitter doesn’t want Americans to know that younger legislators support the president. Why, that might influence others in that same age bracket to jump aboard the Trump Train. The article says that Twitter claims their shadowbanning — hiding the congressmen’s accounts from the search bar — wasn’t to do with anything the congressmen tweeted, but rather their followers. Does the following sound totalitarian? The Daily Caller attempted to find out more from Twitter, but the company did not reply. sparked controversy in April when he endorsed an article calling for a total Democratic victory the “new civil war.” He similarly raised eyebrows in June by apologizing for the sin of eating at Chick-Fil-A. 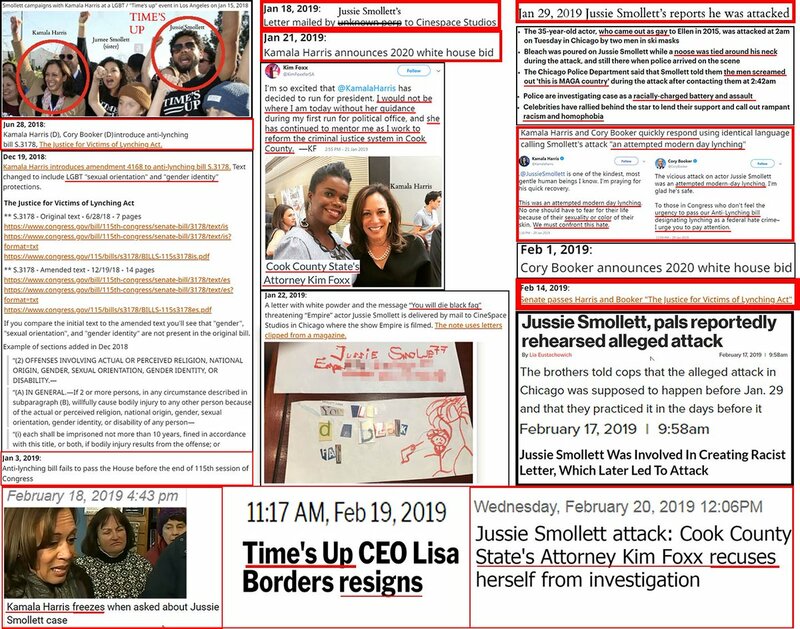 Most people following my site will know that Q is a person or small group of people who probably work for President Trump. For over a year now, Q has asked readers via the Socratic method to analyse what has actually been happening in the United States behind the scenes over the past few decades. Q’s slogan is ‘Where We Go One, We Go All’: WWG1WGA. In other words, we’re all in this together! By contrast, the characteristics of the Democratic Party are all too destructive, corrupt — and, sadly, real. Please read them carefully. The MAGA agenda welcomes everyone, regardless of race, colour or creed. MAGA is a bit old school — a compliment — in that regard. We believe in freedom, duty, sacrifice and the ideals upon which America was founded. We remember and appreciate our history, good and bad. We like tradition and beauty. 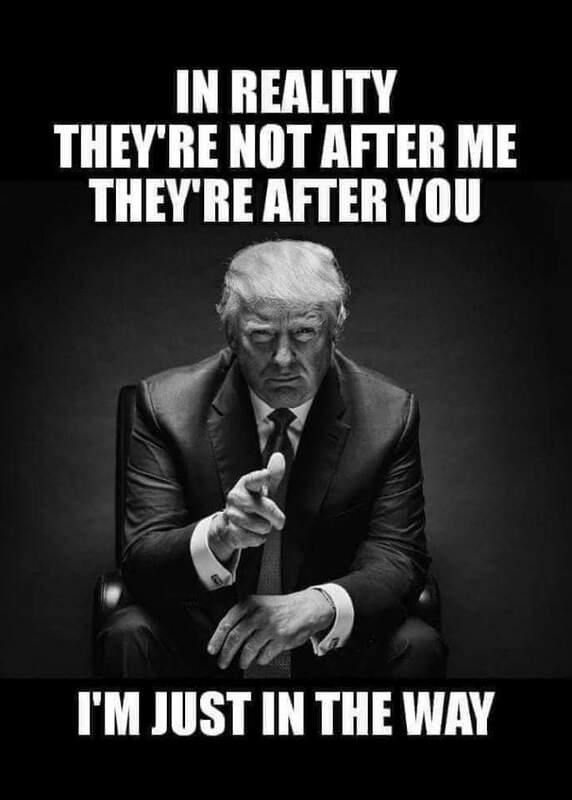 Unlike the Dems, we’re not out to destroy. We’re out to conserve and, where necessary, rebuild with care and attention, in the way the Founding Fathers would have wanted. On Thursday, October 18, 2018, Tucker Carlson featured a video of a crazed leftist ripping up Ted Cruz (R-Texas) campaign signs in Houston’s middle class Montrose neighbourhood. The guy was jumping around and screaming directly into the camera. There is a ‘zombie’ virus infecting raccoons in the US at the moment. Tucker asked whether it made its way to Texas. Then he discussed the attacks — verbal and physical — on Trump supporters. Dan Bongino, a former NYPD policeman and retired Secret Service agent joined him. Tucker rolled footage of CNN’s discussion of the ‘bullying’ tactics of Trump supporters with mugs that read ‘Liberal Tears’ then showed a video of left-wing violence in Portland, Oregon. The two men wondered how CNN could be complaining about mugs when Antifa are tearing up the streets of a major American city. Seriously, the Dems are unhinged. They don’t mind Antifa. Legislators such as Maxine Waters and Tim Kaine encourage leftists to harass decent Americans minding their own business. The decent Americans’ sin? Supporting President Donald Trump. This madness has been going on for two-and-a-half years, since Trump was running for president. It started in Chicago, where Trump’s scheduled rally had to be abandoned in March 2016. Democrats are the party of crime and crazed violence. Stop voting for them.